Generally around SuperPhillip Central, the word "redux" is used for "Review Redux" where I take a second glance at a game I've already reviewed. This time, however, it's an actual game's name that is given the "redux" treatment with Rogue Trooper Redux. Confused yet? I wrote this intro, am supposed to know what I'm talking about, and you bet I'm confused! Oh well. To the review! Way to be a trooper. The original Rogue Trooper came out at a time where cover shooters were just coming in to their own. Unfortunately, the game had competition in the crowded holiday season with a "little-known" (sarcasm definitely intended there) third-person cover shooter called Gears of War for the Xbox 360 releasing. One game moved the needle on how cover shooting is supposed to be done and is still a prime example of it, while the other is Rogue Trooper. Thus, it's clear to say that Rogue Trooper Redux, released on the Nintendo Switch eShop, is a game of its time. What was serviceable in the cover shooter department isn't quite as good now, as that's most apparent when trying to actually aim while behind cover. Quite frankly, it's next to impossible, as your aiming is greatly limited as to what you can shoot. And when you do shoot at the few areas beyond your strict limitations, your bullets generally don't connect. What is laid out as a cover shooter turned more into a run and gunner. You can sure look cool propping up against that rock, but I dare you to be able to see anything to shoot. But hiding behind cover isn't the sole gameplay focus of Rogue Trooper nor its Redux version. It brings more to the table than attempting and failing to do something that Gears of War and its subsequent sequels did magnificently. Starting off, let's begin with the premise of the game. You serve as Rogue, a G.I. who looks like a disgruntled member of the Blue Man Group. Instead of satisfying show attendees with music and paint, Rogue delivers on the battlefield with enemies' screams and blood. His kind is slaughtered before him, but the troopers that served on his squad routinely get their microchips transplanted from their living bodies into Rogue's various arsenal. For instance, right at the beginning of the first level, Rogue's trooper who is the comic relief gets slain, and just before he dies, his microchip is implanted into Rogue's gun. By the third or fourth level's end, all four troopers are back together again (though three travel within the weapons and armor of Rogue) and they're all looking for a taste of revenge. Rogue Trooper Redux feels good to play for the most part. Analog movement on the Switch makes aiming sometimes a bother, costing you precious health in exchange for a steady target and that satisfying kill. Here's where Rogue Trooper gets to be more than just another cover shooter. The game routinely unlocks upgrades for you to purchase with currency from fallen enemies as well as hidden in certain corners and areas of levels. You can upgrade your assault rifle to carry more ammo, invent new grenades like incendiary ones to blaze a burning trail to victory, and also restock on ammo and the most important of all, med kits, which restore health. "Covering is for blankets and quilts. I'm a G.I., dammit!" Rogue's buddies can also be used in various ways to be used to your advantage in combat scenarios. Sure, you might get fed up the game's lackluster cover-based systems and may want to run it and gun it the entire game, but you can also use your buddies' skills like throwing a turret or projecting a hologram of Rogue to have the enemies' attention on those while you sneak behind them and unleash a barrage of bullets in their backs. All's fair in love and war. 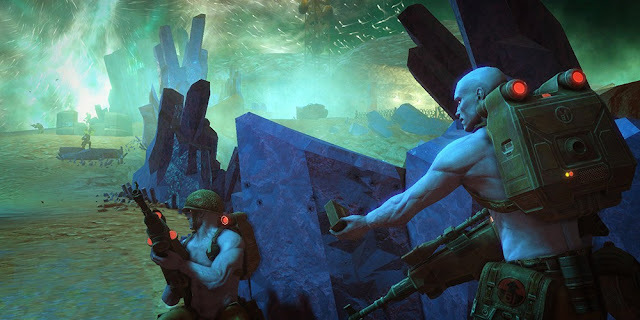 The combat options these abilities provide as well as the upgrade system make for some positive distinguishing features for Rogue Trooper Redux that makes the lack of a compelling (or competent, really) cover system. The campaign of Rogue Trooper Redux will take most players about 6-8 hours. A lot of it will be repeating segments of levels over again as there aren't as many checkpoints as I would have liked in each. Regardless, it's ultimately an engaging enough campaign, though nothing earth-shattering, of course. After the campaign is over, there's a couple online modes with competitive multiplayer as the focus, but defending a base or reaching a specific point in a level didn't really appeal to me to enjoy them at any length. Those looking for a blast from the past can find one with Rogue Trooper Redux, but don't expect an amazing game. Heck, the visuals haven't even received an amazing bump either. The visuals are just like the game, really, dated but passable. 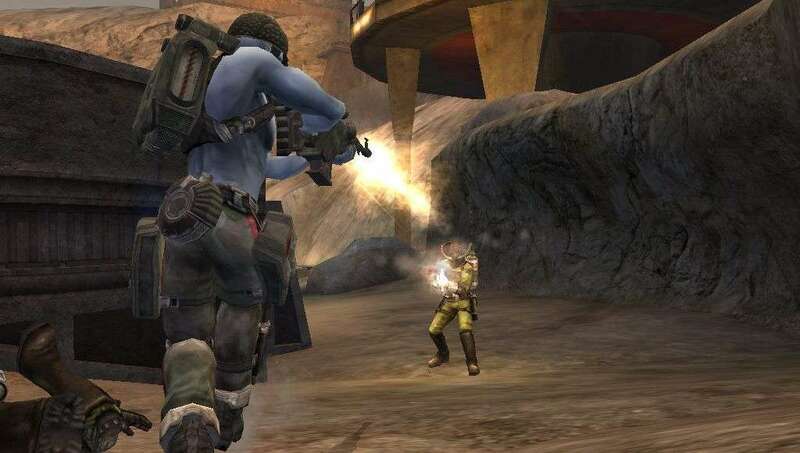 If you really like shooters of the PS2 era (heck, the original game DID release on that platform), then Rogue Trooper Redux might have enough for you, especially if you want to play it in the Nintendo Switch's undocked mode. Otherwise, either wait for a sale or just pick up the PS2/Wii original. Review copy provided by Rebellion. You might notice something new this week as you scroll down this edition of SuperPhillip Central's Favorite VGMs. Instead of clicking on a separate link to have readers go to YouTube (you can still do that, though), why not just click on the video itself, embedded right into the blog for readers to not have to click so many things? That's exactly what I did, making things slightly convenient for myself in the process. See? We both win! On this edition, JRPGs are the flavor of the week. We begin with Final Fantasy III with its originally Nintendo DS-only remake before we enter the early days of online console lobbies with Phantasy Star Online Episode I & II. Our palette of color and sound grows with music from Paper Mario: Color Splash. Then, we finally trek onto magical kingdoms and the Wild West with music from Fantasy Life and Wild Arms 3. As always, check out the VGM Database for all past video game tracks featured on this weekly recurring segment. Now, let's get on to the music! This composition was specifically made for the 3D remake of Final Fantasy III (a title that hit the West for the first time with this Nintendo DS game). Don't get it confused with what the West previously called Final Fantasy III, and that was actually the sixth Final Fantasy mainline entry, Final Fantasy VI. (Maybe it's just better if you just look that background info up if you need to.) Regardless, this orchestrated piece is a medley of themes from Final Fantasy III, and if you think its welcoming you to a breezy adventure, then you have got another thing coming! Our theme this week beyond "easier to listen to music" is that of JRPGs. They come in all sub-genres: turn-based, action-RPG, and so forth. Phantasy Star Online presents us with an MMORPG, one of the earliest for consoles. However, this updated version of A Whole New World is heard in Episode II on the GameCube and Xbox. There's slight differences and unique orchestrations here and there, and it's my preferred way to listen to this rousing vocal track. While many argue that Paper Mario should return to its turn-based, two-party system where enemies give experience points upon being felled, Color Splash on Wii U certainly wasn't as disappointing to most as the Nintendo 3DS's previous Sticker Star was. Not only were elements of the adventuring upgraded, but so was the script, adding a lot more places for some really hilarious humor. One of my favorite things about Sticker Star and Color Splash is the duo of games' music, which Color Splash just excels at. Catchy themes abound in this delightful late release in the Wii U's life. Nobuo Uematsu has yet to surpass the pedestal he put himself on in my nostalgic heart with his compositions in Final Fantasy VI and Final Fantasy IX, but I'd by lying if I said his works in Fantasy Life wasn't a contender. Fantasy Life is an action-RPG where you explore fields, caves, dungeons, and more in search of loot and materials needed to upgrade weapons as well as your tools to adequately also level up your job level in addition to your experience level. Great Plains is a fitting theme to march along and begin your trek across the kingdom in search of glorious adventure! I don't get a chance to talk too much about the Wild Arms series as it doesn't come up a lot in the articles I write, aside from SuperPhillip Central's Favorite VGMs now and then. Well, I get another opportunity, as you can see, with this edition's entry with this battle theme of Wild Arms 3, the first PlayStation 2 game in the Wild Arms franchise. You definitely need a battle theme that sticks with you and doesn't become grating when it's going to be tagging along with your party the entire game, playing during virtually every random enemy encounter in your Wild West adventure. Composer Michiko Naruke once again made sure that didn't happen with her Gunmetal Action battle theme. Though the game's release date isn't for another three weeks now, Xenoblade Chronicles 2's full commercial has been published on Nintendo of America's YouTube channel to view. This ad continues the "Close Call" lineup of ads that also includes Fire Emblem Warriors and The Elder Scrolls V: Skyrim. Xenoblade Chronicles 2 launches on December 1.